Every year my husband and I venture to our lil' bit of paradise, St. George Island, FL, located about 50 miles from Panama City, FL. I am so at peace when I get to this place. I love it because it is not commercialized, if you are looking for great shopping and eating out then you are at the wrong place here. This place is for tranquility, quiet time...down time. Although there are several really good restaurants to eat at there are only few. You can drive across the long bridge to Apalachicola, FL which is the "oyster capital of Florida." Good eats there! Hubby and I just go to the grocery store and stock up and never leave the house...well, if it rains we will venture out some. Nothing better than combing the beach for unique shells to turn into unique treasures. This year I am looking for more oyster shells so that I can make more clay santas out of them. I hope to get several of those done while here. No rest for the weary! LOL I want to sell some at my craft show that is coming up WAY too fast in a couple of weeks. I have been painting some lightbulb bride and groom ornaments and hopefully I will get those finished tomorrow. I have a ton of banana gourds that I wanna get painted up too. When I get home from vacay, I will only have a few days to finish things up for the big show. NERVOUS! LOL Well, here are a few pictures of my first sunrise at St. George Island...hope you enjoy them! It was cloudy that morning and the sun just did not want to rise but eventually it made it! I have been painting on these empty Makers Mark bottles for several years, mostly santas. 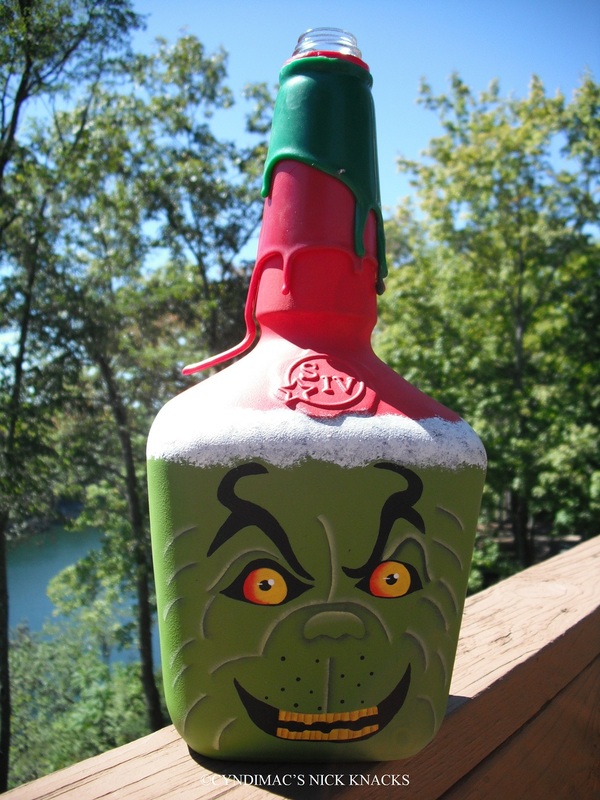 I have forever wanted to design a Mr. Grinch and this is my version. I love painting on things I would normally throw away. I love that at Christmas Makers Mark puts out the green and red wax bottles. Living in Kentucky you MUST bleed blue...that being you MUST be a Kentucky Wildcat basketball fan! I am too among the BIG BLUE NATION and I'm darn proud of it! That being said, I HAD to make some UK ornaments for my upcoming craft show. These are a few that I have come up with thus far! Stay tuned for more! Such fun painting on banana gourds! I have been going to Gatlinburg with 5 other couples for over 30 years and we have the most fun ever...such crazy and fun friends I have. Never a dull moment. Part of the fun is the yummy food that we eat there and I'm not talking about going out to a restaurant to eat, I'm talkin' about home cooked food. I always come away from there with a new recipe or two or learn of a new type or brand of crackers/chips/bread, etc. to buy. My friend Ann Rea makes the BEST breakfast casserole that has asparagus in it and it is to die for! It is so tender and pure comfort food. I can see this recipe being perfect for Christmas morning or on a cold winter day. I hope you like it! I can't wait to make it myself! Spray 9x13 dish with Pam. Butter 1 side of bread slices and place them butter side up in pan. Brown, cook and drain sausage. Sprinkle over bread and sprinkle cheese over that. Mix eggs, half and half, chilies, olives and asparagus. Pour over ingredients. Cover and refrigerate overnight. Bake at 350 uncovered for one hour. It has been hard for me to drag myself away from painting burnt out lightbulbs but I know that I need an assortment of things to sell at my craft show so into my craft room I went and I found quite a few different things to paint on. Told ya I would paint a santa on anything. I took regular clothespins and took them apart and cut out the beard and hat on one side of the clothespin and then painted it up...what fun these were to do. I also have a ton of these wooden pegs and they made a perfect santa. That is exactly what I feel like right now...I am painting a santa on anything that doesn't move. LOL can ya tell although it has been a month since I blogged that I'm having the time of my life? I AM! I don't even know where to start posting pictures of the things I've been doing. I like to call what I've been doing "playing." That is what my dear sweet mom used to call it. She would call me up every week and ask me if I wanted to come over to her house and play...what I'd give if she were here to "play" with me now. I so miss her still and she would have such a blast sitting right along side me doing all the things that I've been doing. I know she is looking down on me and is very proud of what I've been creating. I look back over the years coz I have crafted all my life and I can truly say that I have grown as a "crafter." I like to think that I'm making higher quality things. Most everything I do are my very own creations too. I have been a crazy person painting lots and lots of lightbulb ornaments because I want tons of them to sell at my craft show in October but I have managed to carve out some time to play with some clay too and what better surface to put it on than an oyster shell? I have a huge box of shells that I've collected over the years while on our annual beach vacations so I'm happy to finally be using them up. We are going to the beach here soon on our vacation and I can't wait to replenish my shell supply...such fun browsing the beach for shells that would make a good santa. I hope you enjoy these. 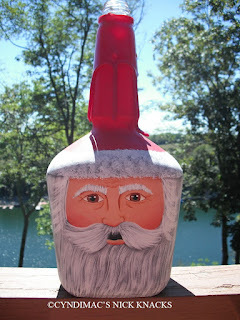 One I left au naturale as I love santas in all colors...who says he has to wear a red hat? Some of my friends wanted to see one with a red hat so I did one of those two! Thank you for looking! Stay tuned!